The cool Fall days are here! 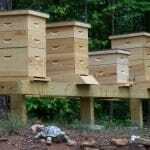 One of our most common beekeeper statements is “my bees died over the winter and there was no honey or pollen” in the hive. 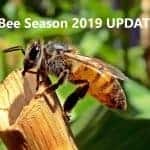 During the late Fall and Winter months, is the period of time, the bees need honey and pollen. When the colony runs out of honey and pollen, the colony will begin to starve. An easy way to determine if there is enough food stores is to go to the rear of the hive and place your hand at the bottom of the bottom board and gently lift the hive upward approx. 1/2″ to feel the weight of the hive. If the hive is heavy then there are adequate honey stores for the colony. Now is the time to begin supplemental feeding to keep the honey reserves adequate for the winter season. If the hive is lightweighted, you will need to start feeding your bees a 2:1 sugar water ratio. There are many options to feed the bees with a standard boardman feeder, internal pail feeder, or a frame feeder. You should not use a boardman feeder if the outside temperatures reach below -15 degrees. Sugar water freezes at -19 degrees. 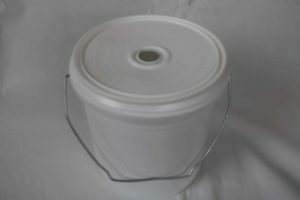 The best feeder for cold weather climates is a one gallon bucket feeder. 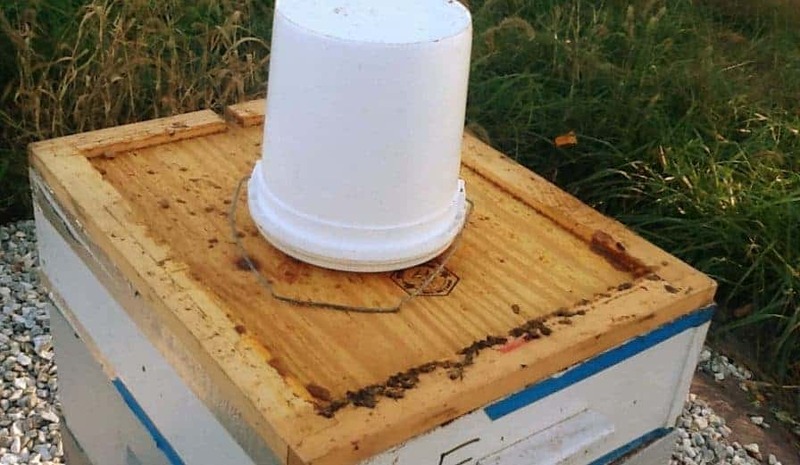 The bucket feeder sets on the inner cover and has two very small holes that work on a vacuum method so the sugar water only flows when the bees are drinking the sugar water. 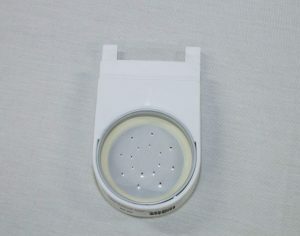 The bucket feeder is then covered with a “deep super” and the outer cover goes on top. Never take the top cover off. Only refill the bucket by pulling the center plug. 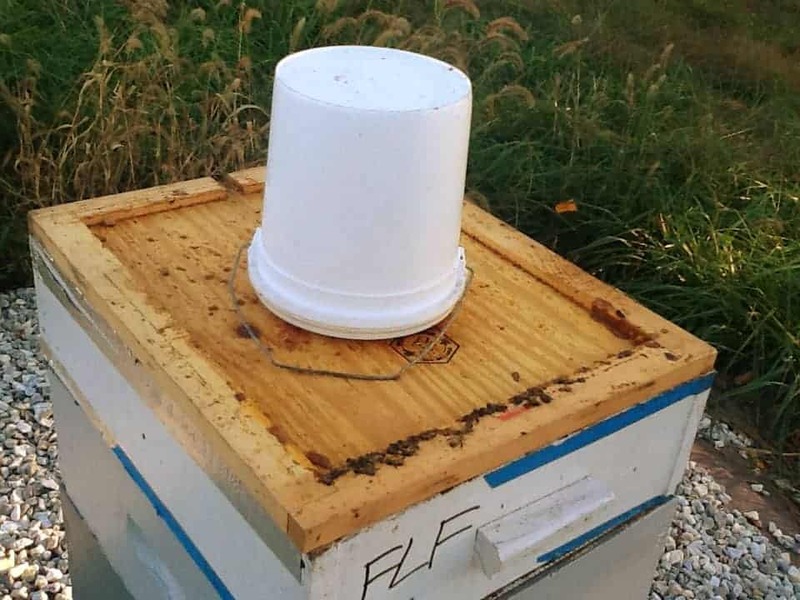 In most cases, a gallon feeder bucket will feed a colony, December – February, and will only need to be filled monthly. 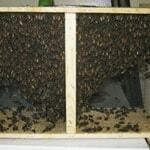 The benefit of using this type of feeder is reducing heat loss in the hive when you are refilling the bucket feeder. Chilling the colony can equal bee loss when you need the maximum amount of bees during the cold winter months. 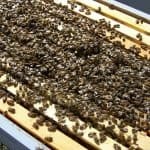 Frame feeders are another way of feeding your bees. 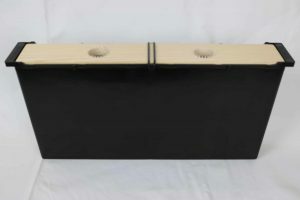 Frame feeders allow quick drinking access for the colony during the cold winter months. These feeders have ladders for the bees to climb down and drink and return to the warm cluster of bees. 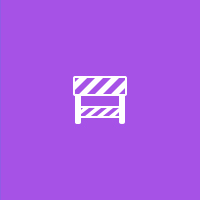 The negative aspect is that you have to open the hive to refill the feeder and thus the warmth of the hive is lost. You can also supplement feed the pollen as lose or as a pollen patty. A pollen patty is made out of pollen and fondant mixed together and placed on top of the upper most supper. I highly recommend feeding pollen patties from December thru February. 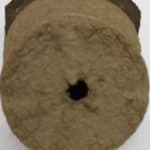 If you monitor the hive weight during the winter, you will ensure your hive is thriving and not just surviving.